Last night I had the honor of going to a local Macy’s Culinary Council Cooking Demo. I had no idea what to expect, but I was hoping to get a little inspiration in the kitchen. Inspiration, along with tips, tricks of the trade, and a fun atmosphere is what I gained by attending the cooking demo. Chef’s Nancy Silverton & Johnny Iuzzini came to the NOLA Event will energy, humor, and some amazing recipes that most anyone could make. Chef Johnny Iuzzini is a 2006, the James Beard Foundation awarded Chef Iuzzini “Pastry Chef of the Year.” In addition he has been recognized as one of the 10 Most Influential Pastry Chefs in America by Forbes and Best New Pastry Chef by New York Magazine, plus he was named one of the Top 10 Pastry Chefs in America two years in a row by Pastry Arts and Design. He has appeared on national television shows, including the Today Show, Good Morning America, Martha Stewart, Paula Dean, and Live with Regis and Kelly, and is the head judge of Bravo’s culinary competition series Top Chef: Just Desserts. Nancy Silverton is an award-winning pastry chef and the founder of La Brea Bakery and co-owner of Mozza in Los Angeles and Singapore. Her cookbooks, Nancy Silverton’s Pastries from the La Brea Bakery and Nancy Silverton’s Breads from the La Brea Bakery, were nominated for awards from Julia Child and the James Beard Foundation, respectively. Silverton’s eighth book, The Mozza Cookbook, was released in August 2011. Chef Nancy Silverton showing guests how to make a simple yet flavorful Kale Salad. Make sure to visit the Macy’s Culinary Council website and see if any of the renowned chef’s are visiting your local Macy’s. It will be an evening to remember. If not, you can pick up the cookbooks of each chef at your local Macy’s OR/And purchased the Macy’s Culinary Council Holiday Cookbook which features recipes from all the chef’s favorite Holiday Recipes. Stay tuned next week for next week as I recreate some of the recipes I learned last night. I can’t wait to share some of the recipes & tips I learned last night. If I can do it, so can you!! Disclosure: I am a member of the Everywhere Society and Everywhere provided me with compensation for this post about Macy’s Culinary Council. However, all thoughts and opinions expressed herein are my own. Oooh, what a fun event! 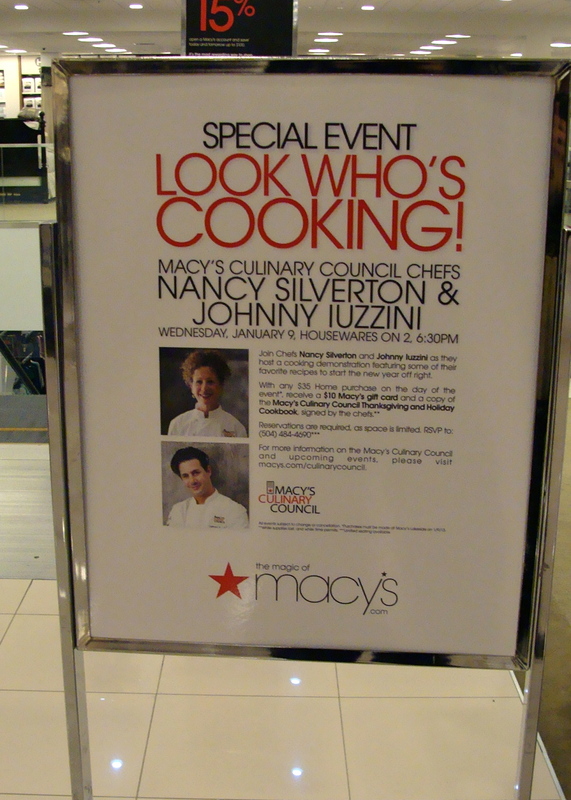 Anything with Macy’s and food/chefs is a winner in my book! I love Culinary Council events! And so jealous of Johnny, he’s been my fave! Great photos! And you are looking fantastic girl! You did something different to your hair since I’ve last seen you right? I can’t wait to see the recipes you learned to make! that sounds like a lot of fun! I love cooking classes and demos! Think I may need to try that dessert book too! Looks like alot of fun, great opportunity. I love La Brea Bakery, I’m sure they had amazing recipes to share! Oh that sounds like so much fun!! Hey, I know Nolamom too Did you learn a lot? What a fun event! I love Macy’s relationship with bloggers! Looks like you had a blast. and great photos! Awwww I want this in LA! How fun!